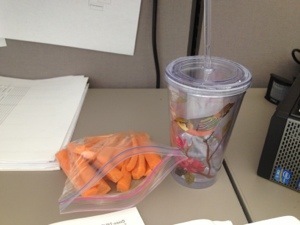 I’ve decided to take the Whole30 plunge again starting today. Since finishing up my first Whole30 in January, I have come to realize that I wasn’t ready to go out on my own and needed a little more time to firmly quelch my sugar cravings. Now that I know what to expect, I feel that this one will go much smoother. I know what my quick go-to foods are, I know that I need to keep eating healthy to ward off cravings, and I want to incorporate exercise more so I can start feeling better sooner. Not sure if exercise is actually proven to improve the benefits of eating clean, but when is exercise NOT a good thing (assuming you’re in good health and all)? Anyway, my last day of not-Whole30 consisted of all things horrible and carby. Another reason why it’s time to climb back up on the wagon. 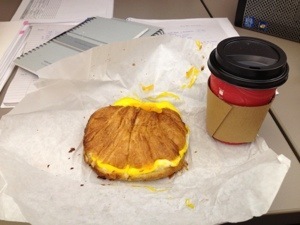 Egg-and-cheese croissant sandwich and coffee with Half-and-Half from my new favorite bakery around the corner eaten at my desk for breakfast. Lunch was a whole bunch of randomness that I purged from my desk – coconut flakes, a can of tuna, leftover carrot sticks, and a box of Cracker Jacks from an office party the other day. 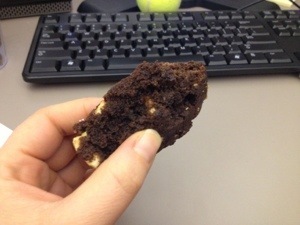 And half a Specialty’s cookie someone left in the break room. 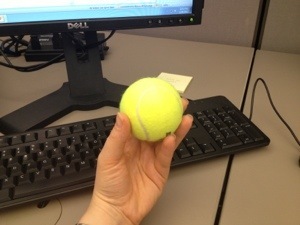 Oh, and I may have sat on a tennis ball for most of the afternoon. My hamstring was really tight from my run Wednesday, and this is the only thing that keeps it from aching. Nothing more awkward than your coworkers catching you rocking your hips back and forth in your chair as you try to massage the ball up and down your leg. At least I looked cute. New skirt from Macy’s, I paired it with all-black and some patent Mary Jane pumps. Sorry for the toilet, I did a bad job of cropping it out. 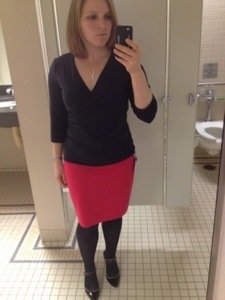 What’s a blog without a little bathroom-mirror-self-portrait action? For Dinner, Hulk and I met at chipotle. I had a chicken bowl with fajita veggies, lettuce, mild salsa, cheese, sour cream, an a side of Squishy helping me eat it. He did not do so well with a spoon as he does with a fork. When we got home it was still early. Hulk offered me a beer. I told him I wanted wine, but I didn’t want to open a whole bottle just for one glass. His brilliant solution was to invite some friends over to help drink the bottle. Friends came over, bringing more wine. One bottle turned into three. Someone suggested we go out for Indian. Samosas, chicken tikka masala, rice, and naan were all consumed. I went to bed late, slightly drunk, with a belly full of carby delight. And this is how I ended my night before a Whole30. Day 1 is going to be fun.